Widespread and common. Adult flight period is from May to the end of August. 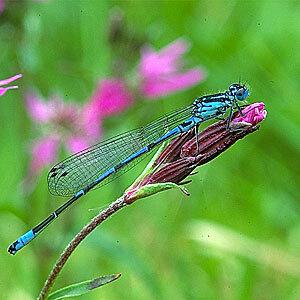 A common and widespread species, especially on cutover bogs where it is usually the most abundant damselfly species. Also found on lowland lakes and ponds. This species is much more general here than in Britain, where it is generally uncommon. This species is similar to the Azure Damselfly Coenagrion puella and the Common Blue Damselfly Enallagma cyathigerum with which it coexists. However the males of the Variable Damselfly are comparatively darker (due to more extensive black markings) and appear more slender. In males segments 4-6 have less blue/more black than in Coenagrion puella and the blue dorsal thoracic stripes are always waisted and form an exclamation mark! In the female there are two colour forms, blue and green. In the blue form there is a black patch on the second abdominal segment shaped like a "mercury" mark,in the green form it is more thistle-shaped. However some Azure females Coenagrion puella have a similar pattern.